Willing to be wrong is more important than needing to be right. In his book, “The Road to Character,” New York Times columnist David Brooks talks about the two competing descriptions of Adam in Genesis, the first book of the Hebrew Bible. There’s “Adam 1” who strives for worldly success and “Adam 2” who is focused on character and spiritual fulfillment. Adam 1 strives for the perfect curriculum vitae while Adam 2 is focused on the perfect eulogy. While I have no doubt that it is “Adam 2” that drives all of us toward the spiritual fulfillment in helping those in need, he is quickly replaced by the “Adam 1,” the Adam of the perfect curriculum vita we need to achieve our certification. Our Adam 1 needs to be right in order to achieve his goal. We attend the right high schools and the best universities. We strive for superior SAT scores and look for the extracurricular activities to assure we gain admittance to the top medical schools where we then focus on the grades needed to gain access to the most desirable residencies and then fellowships. We are rewarded there for making the right diagnosis and prescribing the right therapy and not rewarded enough (or at all) for our empathy towards our patients, their families, or our colleagues. “Adam 2” fades too quickly from our memory. Effective physician leaders need to reawaken their Adam 2’s and help our colleagues reactivate theirs. This tension between CV skills and eulogy skills is the core of the challenge facing physicians who are interested in effectively leading cultural change in today’s complex and dynamic healthcare environment. This inner refocusing is difficult for us. We have spent our formative years learning to be right all of the time. In our clinical environment, we can’t afford to make mistakes or even admit we might have. To reconnect with our inner fulfillment, however, we have to first become comfortable with being wrong. Only when we can allow ourselves to be wrong can we truly listen and appreciate others’ perspectives, suggestions, passions, and fears. 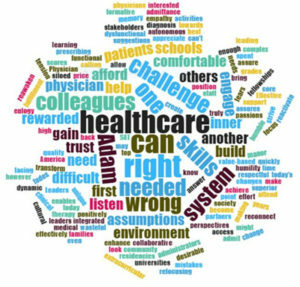 When we are comfortable that we may not know the answer, we achieve the humility we need to build trust and positively engage with all of our partners in our healthcare system: physician colleagues, administrators, support staff, patients and community stakeholders. Our effort to listen to and enhance our “Adam 2” enables us to build trust with one another. Only when we have the skills needed to challenge our own assumptions can we challenge the assumptions of others in a humble and respectful manner. Only then can we engage one another in the difficult changes needed to transform our autonomous, siloed, wasteful and dysfunctional healthcare system into one that is collaborative, integrated, and functional. America today needs Physician Leaders to bring us all back to our calling. We are in a unique position to help create a value-based healthcare system which assures quality healthcare at a price point our society can afford. But first, we have to be OK with being wrong.